Manchester City loanee Chidiebere Nwakali has been nominated for the Norwegian Eliteserien Goal of the Season Award for the 2017 season. Eurosport has shortlisted the versatile Sogndal Fotball midfielder along with nine other candidates for the most eye-catching goal scored in the Norwegian top-flight in 2017. The other nominees include : Simen Kind Mikalsen, Tonny Brochmann, Eggen Hedenstad, Milan Jevtovic, Nicklas Bendtner, Aleksander Melgalvis, Gili Rolantsson, Herman Stengel and Anders Trondsen. Nwakali's powerful strike from 25 yards against Molde on game week 24 is among the most spectacular goals scored in Norway this term. As at the time of this report, the former Golden Eaglets and Flying Eagles star was fourth in the online poll with five percent, behind ex-Arsenal star Bendtner (43 percent), Lillestrom's Simen Kind Mikalsen (16 percent) and Stabæk midfielder Tonny Brochmann (12 percent). The winner of the Goal of the Season award will be announced on Monday 27 November at the Football Festival. 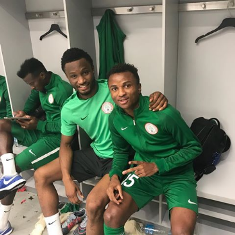 Chidiebere Nwakali was called up to the Nigerian national team for games against Algeria and Argentina this November but was a non-playing sub in both matches.